A simple possession of marijuana charge against University of North Carolina linebacker Quan Sturdivant was voluntarily dismissed this week in Stanly County after he entered a deferred prosecution agreement. Assistant District Attorney John Phillips said this afternoon that Sturdivant will be required to do 24 hours of community service and will have a substance abuse assessment as part of the deferred prosecution agreement. His case was dismissed Monday. Phillips said Sturdivant's lawyer, Charles Parnell, stated that Sturdivant was a person of good character without a prior criminal record who had made a mistake. Phillips said the deferred prosecution agreement was "pretty routine" for someone charged with a Class III misdemeanor. Sturdivant was charged July 10 after a traffic stop in the parking lot of a Bojangles Restaurant in Albemarle. The citation showed that he possessed less than a half-ounce of marijuana. Coach Butch Davis had said that Sturdivant had disappointed the program and would be disciplined, but didn't specify how Sturdivant would be disciplined. Earlier this week, Davis said Sturdivant would not be suspended for the Sept. 4 season opener with LSU. Last season Sturdivant, who is from Oakboro, earned first-team All-ACC honors after leading the team with 79 tackles as a junior. East Carolina moved quickly to replace Mark Nelson on its coaching staff, adding former Texas Tech assistant Duane Price as defensive tackles coach. The school announced Tuesday night that Nelson was stepping down after he admitted observing offseason workouts in violation of NCAA rules. East Carolina announced Price's hiring and a re-organization of the staff today. Nelson had been coaching defensive ends and was special teams coordinator. Running backs coach Clay McGuire, who coordinated Texas Tech's special teams in 2008 and for most of 2007, will take over Nelson's responsibilities in the kicking game. Mark Yellock, who had been coaching defensive tackles, will be in charge of the defensive ends instead. Price served as a defensive graduate assistant at Texas Tech in 2009 and has been on the coaching staffs at Tulane and at A&M Consolidated High in College Station, Texas. He had been retained by new Texas Tech coach Tommy Tuberville, coaching defensive backs during spring practice. East Carolina coach Ruffin McNeill, who had been Texas Tech's defensive coordinator, said in a statement released by the school that Price was a big part of the Red Raiders' success in 2009, when they finished 9-4 with a win over Michigan State in the Alamo Bowl. "I know what he can offer this program," McNeill said. "He's a master technician and motivator with an unmatched work ethic." According to East Carolina athletic director Terry Holland, Nelson decided to step down after an investigation by the school's NCAA compliance office revealed that he had been watching offseason drills in violation of NCAA rules. Holland said the school will report the violations to the NCAA and expects them to be ruled "secondary" rather than "major." East Carolina begins preseason practice on Aug. 6. ESPN announced this morning plans to broadcast in 3-D a trio of early-season nonconference football games involving ACC teams. The three games will be the first ones televised with 3-D technology by the sports cable network, according to a news release issued by the Atlantic Coast Conference. * Sept. 6, Virginia Tech vs. Boise State (Landover, Md. ), 8 p.m.
* Sept. 11, Miami at Ohio State, 3:40 p.m.
* Sept. 18, Clemson at Auburn, 7 p.m.
ESPN also plans to broadcast the Dec. 4 ACC Championship Game in 3-D as well. Yep, readers, you’re right again. Preseason ACC football predictions by the media have been fairly worthless of late. That fact was pointed out to me in numerous messages Thursday from ACC fans who remembered that just a year ago, the summer media poll had Florida State finishing first in the Atlantic Division and Virginia Tech first in the Coastal. At season’s end, Georgia Tech defeated Clemson in the league championship. Both were picked for divisional No. 2 spots in the summer poll. FSU wound up third in the Atlantic and Virginia Tech second in the Coastal. Similar off-target picks have occurred regularly since the ACC first began the summer poll in 1976. Since the ACC went to divisional play in 2005, the poll has been generally on target once. That was in ’05, when FSU (Atlantic) and Virginia Tech (Coastal) were picked first, finished that way and ended with the Seminoles winning the first league title game (as picked). Otherwise, there has not been a perfecta. In 2006, it turned out to be a regular mess with preseason divisional favorites FSU and Miami finishing fifth and fourth, respectively. This year’s favorites, by wide margins, are FSU and Virginia Tech, with the Hokies a solid pick to win the title game. North Carolina, a likely preseason top-20 (or higher) national pick, came in fourth in the Coastal vote. The media summer vote was substantially more accurate in the days before the ACC expanded to 12. From 1976 through 2004, the summer poll favorite finished first or tied for first 19 times. Granted, most of those votes were no-brainers for FSU, which was picked first and finished first or in a first-place tie 11 times from the school’s first season in the conference (1992) through 2003. But some of the summer votes were surprisingly on the mark -- N.C. State in 1979, UNC in ’80 and Maryland in ’85. There were big misreads in 1986 (Maryland pick No. 1, finished No. 5), 1992 (Clemson picked No. 2 behind FSU, finished No. 7) and 2002 (Virginia picked No. 8, finished tied for second). On individual awards, records are less complete. A year ago, Georgia Tech running back Jonathan Dwyer was the summer choice for player of the year by a close margin over Clemson runner/returner C.J.Spiller. In the postseason vote, Spiller won easily with Yellow Jacket quarterback Joshua Nesbitt finishing second in the voting. If there’s a media bias against North Carolina football player Marvin Austin and his teammates, it wasn’t apparent in the voting for the preseason all-ACC team that was released today. Austin, a senior defensive tackle and a target of NCAA questions about possible improper dealings with professional agents, easily was voted to the team, which was selected by more than 300 media representatives at the league’s summer interview sessions Sunday and Monday in Greensboro. Among the four defensive front players picked, Austin trailed only teammate Robert Quinn in votes received. Quinn got 47 votes from those who participated. Austin received 32, five more than fellow tackle pick Jarvis Jenkins of Clemson. What’s more, three other Carolina defenders were selected -- linebacker Quan Sturdivant and defensive backs Kendric Burney and Deunta Williams. The only defenders who landed more than 40 votes were Quinn, Williams (41) and Clemson defensive back DeAndre McDaniel (48). Speculation about Austin and Carolina’s perception within the media began Monday, when the same voters picked the Tar Heels to finish fourth in the six-team Coastal Division. A theory quickly evolved that UNC (8-5 overall, 4-4 ACC last season) was low-balled because voters believed Austin and the team were in line for sanctions. The all-star voting instead underscores the apprehension about the team’s offense against a schedule that includes LSU and Rutgers outside the ACC and games against Florida State, N.C. State and Clemson from the league’s Atlantic Division. Including his three years at Carolina and six years at Miami (1995 through 2000) before its membership in the ACC, Butch Davis is 1-3 against State and 1-6 against FSU. The voting outcome also reflects the influence of preseason NFL prospects lists. The five UNC defenders, plus linebacker Bruce Carter, are predicted to be first, second or third-round picks in the April, 2011 draft. Less voting attention obviously was paid to the fact that Carolina’s defense, with those same players plus standouts Cam Thomas and E.J. Wilson, gave up 1,260 yards in its final four 2009 games against Miami, Boston College, State and Pittsburgh. Finally, of course, there’s a huge disconnect in the all-star and standings predictions. Virginia Tech, an overwhelming choice to win the ACC title, had only one player on the preseason team -- running back Ryan Williams. Among the overlooked Hokie defenders were two of the very best players in the conference -- cornerback Rashad Carmichael and tackle John Graves. Even more surprising was the voting at quarterback. Last season’s first-team all-conference pick, Georgia Tech’s Joshua Nesbitt, could not out-poll Florida State’s Christian Ponder, who didn’t even make the second-unit after the ’09 season. While preseason votes are soon forgotten and don’t carry much weight, it’s for certain there will not be five Carolina first-team picks on the postseason first unit if the team can’t finish higher than fourth in the Coastal. North Carolina’s Marvin Austin is among five Tar Heel defenders on the first-team all-ACC preseason football list. The senior defensive tackle has been involved in an NCAA investigation concerning possible illegal contact with agents. The preseason team, voted on Monday by the media at the ACC summer kickoff interviews in Greensboro, also included UNC defensive end Robert Quinn, linebacker Quan Sturdivant, safety Deunta Williams and cornerback Kendric Burney. Preseason conference favorite Virginia Tech placed only running back Ryan Williams.N.C. State tight end George Bryan and Duke receiver Donovan Varner were on the team. Wake Forest failed to place a player. B Kendric Burney, North Carolina (27) 5-9 190 Senior Jacksonville, N.C. Specialists Pos. Name (Votes) Ht Wt Class HometownPK Matt Bosher, Miami (32) 6-0 205 Senior Jupiter, Fla.P Matt Bosher, Miami (20) 6-0 205 Senior Jupiter, Fla.SP Torrey Smith, Maryland (24) 6-1 210 Junior Colonial Beach, Va.
East Carolina assistant football coach Mark Nelson has stepped down after admitting breaking NCAA rules by evaluating players during off-season workouts that were supposed to be voluntary, school athletic director Terry Holland announced. Nelson was hired in February to serve on first-year coach Ruffin McNeill's staff as defensive ends coach and special teams coordinator. In a statement, Holland said East Carolina's office of NCAA compliance has been investigating possible violations of an NCAA rule that prevents coaches from evaluating players during the offseason. "When a coach observes these normal activities, the NCAA considers the activities to be non-sanctioned out-of-season practice," Holland said in the statement. Holland said McNeill called in Nelson to discuss the possible violations. According to Holland, Nelson admitted violations that are likely to be ruled "secondary" rather than "major" after the school's formal report is filed with the NCAA. "Coach Nelson and coach McNeill agreed that these violations would be a distraction to the team at this critical time of the year and coach Nelson offered to step down from his position," Holland said. "His offer to step down was accepted by coach McNeill pending negotiation of a severance agreement with the athletic administration and the university." Holland said the East Carolina compliance office will file a formal report and cooperate fully with the NCAA. Nelson served as defensive coordinator and linebackers coach for the Winnipeg Blue Bombers of the Canadian Football League last season. He had 23 years of combined professional and college experience, and had coached in the SEC, Big 12, Big East and Conference USA. N.C. State coach Tom O'Brien spoke with the media for 54 minutes Monday at the ACC media kickoff in Greensboro. O'Brien discussed linebacker Nate Irving's return to the team after missing last season with injuries suffered in a car crash; quarterback Russell Wilson's impending return after playing minor league baseball; the return of offensive coordinator Dana Bible from a battle with leukemia, and other topics. - Although O'Brien isn't sure Irving has regained 100 percent of his explosiveness, the coach said Irving was "1,000 percent" better after spring practice than running back Toney Baker was at the same time a year ago while coming back from a knee injury. O'Brien expects Irving to make a huge difference on defense. "The thing that Nate does, Nate finishes plays," he said. "He always has been a finisher. A lot of guys can read things, and a lot of guys get there, and they like to inspect the body once they get there. That's not Nate. He goes and makes the play." - Although Wilson hasn't played much football since November because he has been preoccupied with baseball, O'Brien expects him to be prepared when training camp starts. Wilson also lost his father, Harrison Wilson, this summer after a long illness. "Certainly his dad wished that he’d be an NFL football player and a major league baseball player," O'Brien said. "I believe he's coming back this year to try to solve the issue of, 'Can he be an NFL player?' He's already got his opportunity to be a major league baseball player. I think that keeps him focused and keeps him driven." O'Brien also said it's backup Mike Glennon's job to push Wilson for the starting position. That's his job, is to try to win the job from Russell Wilson," O'Brien said. "That way we'll have great competition. We'll have two guys fighting for a job, and we're going to have a heck of a quarterback come Sept. 4." - O'Brien expects offensive coordinator Dana Bible to be able to call plays from the press box after recovering from treatment for leukemia. Nonetheless, O'Brien has put himself in position to call plays as he did in a winning effort against North Carolina at the end of last season, just in case Bible doesn't feel up to the task. O'Brien also is asking some of the other assistants to share game planning and practice planning responsibilities to take some of the load off Bible as he returns full time. "He's got to understand that there are going to be times that he's going to feel good and be able to do things out there," O'Brien said. "And there are going to be times when he can't." - O'Brien said R.J. Mattes, who started as a redshirt freshman last season on the offensive line, is slated to return to practice in September or October after tearing a knee ligament last year at Florida State. The coach is eager for Mattes to return. "He's a football player," O'Brien said. "He likes the game. He's a tough kid. He plays with an attitude like you would like to have on the offensive line. Those are all things that adding that, mental toughness is one of the hardest things to get in a football team, but he's one of those guys that is mentally tough." - O'Brien said new athletic director Debbie Yow has told the football staff that she looks forward to having a long-term relationship with them and to winning an ACC title. "She said, 'Tell me what I have to do to help you win and let's get this thing going," O'Brien said. He said the only thing N.C. State needs from the administration is an indoor facility where the team can practice in inclement weather. "The rest we have to do," he said. "But certainly being healthy would go a long way toward helping us all do what we have to get done." Drug charges were dismissed against three N.C.State University football players in Wake County district court today after a judge ruled an off-duty police officer had searched an off-campus apartment without following proper legal procedures, a court official confirmed. Jake Vermiglio, Markus Kuhn and J.R. Sweezy were charged in April with possession of marijuana and drug paraphernalia, and maintaining a dwelling for the use of controlled substances. An off-duty Raleigh police officer working security at the College Inn complex on the 2700 block of Western Boulevard reported smelling the strong odor of marijuana from the doorway of a third-floor apartment as he walked the hallway at about 1 a.m., according to a warrant. Charges were dismissed against Vermiglio, Kuhn and Sweezy. A fourth player, George Bryan, was charged only with maintaining a dwelling for the use of controlled substances in the same case; he has a Sept. 3 court appearance scheduled. After knocking on the door and meeting the tenants to confirm his observations, the warrant said, investigators seized three plastic bags filled with about six grams of marijuana, a "blunt" cigar stuffed with marijuana, two homemade bongs and other paraphernalia. In court Tuesday morning, defense lawyers for the players argued that the arrests came after an illegal search. Wolfpack football coach Tom O'Brien said Monday - the day before the court appearance - that all the players will be with the team when it starts practice, and that Sweezy, who had been suspended, is off suspension. This was the second time in two months that Sweezy had charges against him dismissed. On June 3, misdemeanor charges of assault and larceny were dismissed against Sweezy in Iredell County. Those charges stemmed from a March 18 altercation with a shuttle bus driver in Mooresville. O'Brien handled their discipline internally, except for Sweezy, who was suspended after the Mooresville incident and missed some of spring practice as a result. Duke head coach and offensive guru David Cutcliffe has a solid reputation for expanding his playbook. Now, he's working on padding out the dictionary. Asked to describe the changes on defense for the Blue Devils, who are moving away from a strict 4-3 scheme, Cutcliffe said, "What we're switching to is 'multicality.' "
Coming less than a week after North Carolina coach Butch Davis added "expediate" to the lexicon, you have to wonder if someone slipped a vocabulary-enhancing drug into the water pitcher at the head table at the Pigskin Preview. All kidding aside, Duke used the departure of its former defensive coordinator (Mike McIntyre, who became the head coach at San Jose State) as an opportunity to bring in some new coaches who brought with them new schemes. That will include some 3-4, among other tweaks. "We've been so pure 4-3," Cutcliffe said. "So we're going to be in a lot of personnel groupings. ... We had a lot of fun watching it in the spring. It really puts a premium on speed. We're going to put a lot of speed on the field." UNC's Yates: Am I allowed to accept this? GREENSBORO -- UNC quarterback T.J. Yates took part in the annual golf outing at the ACC Football Kickoff on Monday morning -- and won the award for closest to the pin. When his victory was announced at lunch, the senior quipped, "Am I allowed to accept this?" as he was handed his prize. GREENSBORO -- Clemson left tackle Chris Hairston, the 6-foot-7, 325-pound man largely responsible for quarterback Kyle Parker’s passing protection, believes the Tigers will be an ACC championship contender with or without quarterback Parker. “We’re pretty sure he’s going to be with us,” Hairston said at Operation ACC Football. Parker, who passed for 20 touchdowns and more than 2,500 yards in the Tigers’ drive to the ACC Atlantic Division title in 2009, has been involved with negotiations with Colorado Rockies baseball team. Last week, Parker announced he would return to Clemson for his redshirt sophomore season, even though speculation continues that he might sign a baseball-only contract. Parker, from Jacksonville, Fla., technically has until Aug. 16 to make a decision relative to baseball or college football. Upon enrollment on Aug. 17 for classes at Clemson, Parker would become ineligible for baseball competition with the Rockies until the January, 2011. Wake Forest coach Jim Grobe minces few words about his football team, even if his assessments include pointed critiques of himself. Thinking back to last year’s Demon Deacons, a team that finished 5-7 overall and 3-5 in the ACC, Grobe said coaches missed the mark and should have called more often on running back Josh Adams. “We missed the boat on that,” Grobe said at the ACC media kickoff. Grobe said coaches were reluctant to use the former Cary High standout because he suffered several injuries during his sophomore season, requiring shoulder surgery aand treatment for his knee and ankle. Adams, the ACC rookie of the year in 2007, enters his senior season. He has 1,896 career rushing yards, which ranks 11th on Wake’s all-time career rushing list. He rushed for just 541 yards on 113 attempts. With the graduation of four-year starter Riley Skinner, the Deacs must reconfigure their offense, which may include more option and running schemes. Grobe said his offensive line is built to lead a run-oriented offense. Adams, he said, has developed into a more physical runner since arriving on the Winston-Salem campus. He’s listed 6-feet, 185 pounds and appears ready for heavy workload. “I’m all about more running,” Adams said on Sunday. Tudor's Take: Is UNC's Austin in line for preseason honors? GREENSBORO -- It will be interesting to see if North Carolina defensive lineman Marvin Austin is voted to the preseason all-ACC team. Linked to an NCAA probe relating to potential inappropriate contact with an agent, Austin is one of seven Tar Heels defenders on the list of nominees. Media attendees at the league football kickoff were scheduled to vote on the preseason offensive and defensive teams this afternoon. Austin is one of only seven nominees for the two defensive tackle slots, and Virginia Tech star John Graves almost certainly will take one berth. Other than Graves and Austin, the other defensive tackle nominees are: Jenkins (Clemson), Charlie Hatcher (Duke), Everett Dawkins (Florida State), Mike Conrath and Nick Jenkins (Virginia). On offense, seven other Carolina players are listed, including wide receiver Greg Little, who also was interviewed by NCAA investigators two weeks ago. The team will be announced at 11 a.m. Wednesday. GREENSBORO -- N.C State sophomore cornerback Rashard Smith will miss the entire season because of a knee injury, coach Tom O’Brien said. Smith played in five games as a true freshman last season, and was expected to compete for a starting slot this year. GREENSBORO -- The last time Duke was picked to finish better than last in the ACC, or at least its conference division, in the league's Football Kickoff Preseason Poll was 1999 (when the Blue Devils were predicted to finish seventh). So head coach David Cutcliffe was pleased to see that his team, which won five games last season, was chosen to finish fifth in the talent-heavy Coastal Division. In all, it racked up the 10th-most points (169) from the voting media out of 12 teams. "So it's progress, but I also know I've been picked fifth in the SEC West and won it. And I've been picked high and hadn't done so well. ... I'm trying to figure it all like you all are. It's difficult to predict. I think the right teams are in order; I don't know if we even belong up where do [are] just yet, but we'll see. That's why we played the game." GREENSBORO - Coach Ralph Friedgen, whose Maryland team finished 2-10 last season, acknowledged Monday that his team has to perform better if he is going to keep his job. Friedgen was asked whether upcoming changes for Maryland at athletic director (Debbie Yow left for N.C. State) and president (C.D. Mote is retiring) have any bearing on the coach's future. "I think if I do well the next two years, I'll be at Maryland," Friedgen said. "If I don't, I won't. So it doesn't matter about the change in administration." Mote did not ask Friedgen to be part of the committee participating in the search for Yow's successor. Friedgen said he was relieved rather than disappointed. He said participating on such a committee would have consumed many hours of his time. He considers it unlikely that Maryland will hire an athletic director before hiring a new chancellor, so there's a chance the process will drag on. And frankly, with his job on the line, Friedgen doesn't have the time to be a part of it. "I've got to focus on winning the games," Friedgen said. That's not going to be easy. The media that cover the ACC picked Maryland last in the Atlantic Division in the preseason poll released Monday. The Terrapins also placed last in 2009. Former Athens Drive High defensive back Pete Singer, who has had numerous brushes with the law, is not on N.C. State's roster for the fall after signing with the Wolfpack in February. Singer's charges have included three citations for driving after consuming alcohol under the age of 21. Team spokeswoman Annabelle Myers was only able to confirm Sunday that Singer is not on the team's roster. GREENSBORO - Maryland faces a huge opener on Labor Day (Sept. 6) when it visits local foe Navy in Baltimore in a game that's sure to attract a lot of attention around the nation's capital. Maryland finished 2-10 last season and needs to build early momentum with coach Ralph Friedgen's future apparently in jeopardy. The Terrapins face a program that has gone to seven straight bowl games and finished 10-4 last season. Navy's unusual, triple-option offense usually causes offenses fits, but Maryland linebacker Alex Wujciak said the Terrapins might be better off playing the Midshipmen early. "We've got camp to prepare for them," Wujciak said. "It's not like we have three days to prepare for them. So it works out perfect for us." Wujciak's brother, Connor, recently committed to another ACC school, Boston College, rather than following Alex to Maryland. Sheepishly, Alex Wujciak said Connor liked the Boston College coaching staff and needed to make his own decision. "I wasn't going to force him anywhere," Alex said, smiling, "but it's a decision he'll have to live with for the rest of his life." GREENSBORO — A month ago, the talk surrounding North Carolina's football team was about its top-notch defense, its opener against LSU, and whether it might have a shot to make it to the league championship game. So quarterback T.J. Yates admitted Sunday that is it frustrating that chatter has instead turned to the ongoing NCAA investigation. "It's a little bit of a distraction, but the good thing is we're not in school right now -- so we get a little bit of a break before, and when we come back hopefully this will all be resolved, and we'll be ready to play,'' he said. The NCAA is looking into violations that may have been caused by improper contact between agents and college athletes. Greg Little Sr., the father of Tar Heels receiver Greg Little, said his son was interviewed by the NCAA. 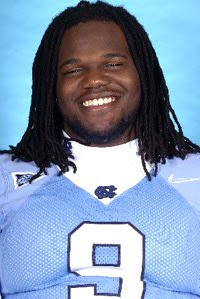 The Charlotte Observer and News & Observer have confirmed that defensive tackle Marvin Austin also was interviewed. Investigators also have met with University of South Carolina tight end Weslye Saunders, who is from Durham, and Alabama defensive tackle Marcell Dareus. Yates, a senior, said he learned about the investigation via team chatter, "and then of course it blew up in the news and on the internet." But he is trying to take a positive approach. "No matter what happens, we're going to learn from it -- get through it,'' he said at the ACC Kickoff. "The adversity is hitting us early, so we're going to be able to get over it, and come together as a team. GREENSBORO -- After missing all of last season battling cancer, it would be enough just to see Mark Herzlich on the field again. Doctors told him he'd never run again, so merely putting on a helmet would mean the Boston College linebacker has far exceeded expectations. That's not good enough for Herzlich. "I'm pushing to get back to where I was," Herzlich said. "Settling for anything less, or even expecting anything less, it would make no sense to come out and play again." The 22-year-old was diagnosed with Ewing's Sarcoma, a rare form of cancer, in his left femur last May but was declared cancer-free in September. Since then, he has openly embraced his role as an example and role model for cancer victims. "It has been by choice," Herzlich said. "It's something I want to do. It wasn't forced on me. Besides football, this is what I want to base my life around." One of his Boston College teammates, wide receiver Ryan Lindsey, started raising money for cancer research in the middle of last season, and by the end of the year contributions were pouring in from all over the football world -- from other ACC teams, officials, even commissioner John Swofford. All told, it totaled more than $220,000. For Herzlich, it's just the beginning. "It has changed my life already," Herzlich said. "I meet people I wouldn't otherwise have met, cancer patients and survivors and people who have lost people to cancer. You really see a whole different range of emotions." GREENSBORO -- Last year, Clemson came to the ACC Football Kickoff with life-sized posters of running back C.J. Spiller to promote his Heisman Trophy candidacy. Spiller, despite a solid all-around season, didn't get far, finishing sixth in the voting. This year, Florida State handed out portfolios embossed with 'CP7' to push quarterback Christian Ponder for the Heisman. The redshirt senior, who already has his MBA and is working on a Masters in sports management, has endorsed the campaign, even if he hasn't put those graduate degrees to use on its behalf. "They came to me in the beginning of the process and made sure I was comfortable with everything that was going on," Ponder said. "There will be more, I'm sure. Have I pitched them anything? No, I'm not that creative. I would never have come up with something like this." Ponder may be a Heisman candidate, but he feels a little left out among college football's social elite. While controversy swirls over a party in Miami for players that may have been thrown by an agent, Ponder cheerfully poked fun at the issue that has loomed over this entire weekend. "I've never been offered (anything)," Ponder said. "I was a little offended I didn't get invited to the party. I was expecting my invitation to be in the mail." GREENSBORO - N.C. State wide receiver Owen Spencer didn't hesitate Sunday when asked to identify the most important factor if the Wolfpack is going to contend for an ACC title. "If we stay healthy," Spencer said Sunday at the ACC football media kickoff, "we have a better shot." Injuries have seriously depleted N.C. State's roster over each of coach Tom O'Brien's three seasons with the Wolfpack. Last season, the team's best defensive player, linebacker Nate Irving, suffered injuries in a June car wreck that kept him out for all of 2009. Along with Irving, Toney Baker, Donald Bowens, Andre Brown and Anthony Hill are among the many key players who have missed substantial time for N.C. State over the last three seasons. "It's always frustrating, especially when you know those guys off the field and what they go through," Spencer said. "Hopefully we will be healthy, and that comes with training well and eating right and all the things that prevent [injuries]." It sounds as if Spencer, who caught 30 passes for 765 yards last season, has been training well. Though he declined to give specific numbers, he said his bench press and his power clean marks, in particular, have soared in the weight room. "I'm at my healthiest," Spencer said. Irving, meanwhile, said he is at full go for the start of fall practice Aug. 3. He said he wasn't satisfied with his performance in the spring game, as he still was shaking off the cobwebs and getting used to playing after injuries to his leg, shoulder and ribs. "I don't know how much of a difference I can make as far as being on the field," Irving said. "All I know is, I'm going to demand 100 percent of everyone who's lined up next to me." He will do that while playing a new position. Irving has moved from the boundary linebacker spot on the outside to middle linebacker. As a result, he has an opportunity to be in on every play in the middle of the field. But he also faces a bigger physical challenge in some ways. "I take on a lot more blocks in the middle," he said. "I've got to deal with the linemen a lot more." GREENSBORO – With Riley Skinner under center for the past four seasons, Wake Forest assumed the identity of a pass-first-pass-often football team. Skinner, a four-year starter, arrived on campus with an accurate passing arm and eventually became the program's career leading passer. Acknowledging their quarterback's arm, the Demon Deacons, led by coach Jim Grobe, played to their strength. Skinner's graduation this spring forces the Deacs to find a new offensive strength. And headed into 2010 pre-season camp, their new direction isn't so clear, with four quarterbacks expected to compete for the open spot and offensive coordinator Steed Lobotzke tinkering with offense. "It's going to be different," Wake senior Russell Nenon said on Sunday during the ACC's conference kickoff at the Grandover Resort. "It's hard to replace a guy like Riley," Wake senior Josh Adams said. Junior Skylar Jones is a strong contender to earn the starting job, though he has competition in sophomore Ted Stachitas, redshirt freshman Brendan Cross, plus two true freshmen in Tanner Price and Patrick Thompson. Adams, the Cary High graduate, said the offense is likely to shape after the quarterback who fills the starting position. For much of Skinner's tenure, the Deacs operated out of a drop-back offensive system that centered around Skinner's arm. What will they look like next season? "I wish I could tell you," Adams said. "One day we might do the spread, one day we might do the wing. It's all up in the air right now. We worked a lot doing the option, we did the I-[formation], we did the spread as well. "We worked a lot of things in the springs because we had different quarterbacks with different abilities." Adams, who ranks 11th in school history with 1,896 career rushing yards, said it's simultaneously exciting and nerve-wrecking to have so much uncertainty surrounding the Deacs' offense. Still, he said players will find their way. GREENSBORO -- Dealing with what has become known as The Agent Problem is going to require a lot of help, ACC commissioner John Swofford said Sunday, calling for assistance from the NFL, NBA and their respective unions. "They need to give us some help as far as sanctioning agents and/or runners who don't act appropriately," Swofford said. "As a collegiate community, we have no hammer with those people." Swofford lauded the investigation launched by N.C. Secretary of State Elaine Marshall into potential agent involvement with North Carolina football players and encouraged the other states that have similar laws to do the same. But perhaps his most curious call for action was directed at the body already charged with monitoring, investigating and punishing illegal interaction with agents: the NCAA itself. "We spend a lot of money on the NCAA," Swofford said. "Maybe some of that money would be better spent on a larger and more efficient investigations staff." Swofford's comment could be interpreted as a subtle shot across the bow, particularly among those who feel the NCAA is sometimes more concerned with protecting its lucrative monopoly than it is the welfare of the athletes who generate that revenue. Whether Swofford meant it that way or not, his choice of words certainly raised eyebrows. In any case, Swofford made it very clear he felt the problem went well beyond the capacity of schools and conferences to regulate it. "As an athletic director, as a coach, you feel vulnerable," Swofford said. "It's not an easy situation to control from an institutional standpoint." A North Carolina football recruit said a Tar Heels assistant coach told him that the NCAA investigation would not affect UNC's future bowl status or have an impact on future recruits. Tim Scott, a cornerback from Stafford, Va., said he was told by assistant coach Charlie Williams that UNC's bowl status would not be affected by the NCAA investigation. Scott, reached by phone on Sunday afternoon, said Williams also talked to him about the punishment for the players involved in the NCAA investigation. He clarified a Virginia newspaper report from Saturday that attributed the quotes to head coach Butch Davis. "Coach Williams said the players involved would have to pay back what they received and it wouldn't be an issue for future recruits," Scott said. "I didn't talk to coach Davis about the NCAA investigation." Williams is UNC's receivers coach in his fourth season. He previously coached with Davis at Miami and also in the NFL. Scott, rated a three-star cornerback by Scout.com, committed to the Heels on Saturday. Davis acknowledged the UNC football program was being investigated on Thursday but declined to provide details about the number of players involved or the potential severity of the probe. The NCAA interviewed Tar Heels receiver Greg Little in Chapel Hill, the player's father said last week, as well as defensive tackle Marvin Austin, The News & Observer has confirmed. The NCAA conducted the interviews on July 12 and July 13, according public documents acquired by the N&O. UNC has insisted from the public announcement of the investigation on July 15 that NCAA will not allow them to comment. At least two players, quarterback T.J. Yates and cornerback Kendric Burney, have addressed the subject on Twitter. GREENSBORO -- The ACC is beginning a new four-year cycle of bowl partners, with the Hyundai Sun Bowl and Advocare V100 Independence Bowl replacing two West Coast bowls that didn't have much appeal for the ACC. All told, the ACC has eight bowl slots, not including a potential berth in the BCS Championship Game. But as any N.C. State fan can tell you, sometimes nine teams are bowl-eligible. What's the plan then? ACC associate commissioner Michael Kelly said Sunday that the league also has a conditional arrangement with San Francisco's Kraft Fight Hunger Bowl, previously known as the Emerald Bowl and a former ACC bowl partner, but could also find itself with an orphan team again, as it did with the Wolfpack two years ago. If the Pac-10 or WAC were unable to provide eligible teams for that bowl, the ACC would be able to send a ninth team west. "We're kind of secondary," Kelly said. "If those conditions didn't exist, then we would be in sort of that free-agent market again." When the Wolfpack squeaked into bowl contention with a 6-6 record in 2008, Kelly spent a long weekend paging through the rule book and working the phones before finding N.C. State a home in the Papajohns.com Bowl in Birmingham, Ala.
ACC commissioner John Swofford did note that of the ACC's eight bowl games, all on ESPN or ESPN2, there's only one overlap: the second half of Charlotte's Meineke Car Care Bowl and the first half of the Sun Bowl. The new tie-ins increase the league's bowl revenue by 30 percent, Swofford said. GREENSBORO - After a summer of wild speculation followed by some expansion in other conferences, ACC commissioner John Swofford on Sunday said he is comfortable with the ACC’s strength going forward. The big changes have Colorado and Utah joining the Pac-10, and Nebraska entering the Big Ten to give each of those conferences 12 members. But for a time, it appeared the Big 12 was in danger of collapsing. There were reports that the SEC might try to pry some combination of Clemson, Florida State, Georgia Tech and Miami away from the ACC to form a 16-team superconference. There also was talk that the Big Ten might be interested in Maryland. Those moves never came to pass, and the ACC remains at 12 members. "At the presidential level of this league there continues to be a strong commitment to each other, a strong commitment to the ACC," Swofford said at the beginning of the ACC Media Kickoff. "There's a belief that 12 is the right number for us, but a willingness if the world changes around to take a look at what the changes mean and what keeps the Atlantic Coast Conference strategically as one of the most prominent conferences in America." Swofford said that the ACC's recent contract negotiations, which resulted in a pact with ESPN worth a reported $155 million over 12 years, have the conference in good position for the future. "It was a very important negotiation for us that had something to do with how solid we are as a conference," Swofford said. Former N.C. State football great Dennis Byrd, who will be enshrined into the College Football Hall of Fame in December, died Friday, N.C. State sports information director Annabelle Myers confirmed. Byrd suffered a heart attack last week and had been hospitalized in Charlotte. He played defensive tackle from 1964 to 1967 under Earle Edwards. He was a member of the famed "White Shoes" defense that led N.C. State to a share of the 1965 ACC title. He also was a member of the team that captured the Wolfpack's first postseason win, over Georgia in the 1967 Liberty Bowl. Byrd was the first football player to be a three-time All-ACC selection, and in 1967 became the first N.C. State player to be selected a consensus All-American. He was drafted No. 6 overall in the 1968 NFL draft by the Boston Patriots, but lasted only two seasons because of a knee injury suffered at N.C. State. After retiring from football, he embarked on a 30-year teaching and coaching career. A native of Lincolnton, he has four children and resided in Elizabeth City with his wife, Kimberly. North Carolina Secretary of State Elaine Marshall today launched an investigation into possible improprieties by sports agents in the state. Spokesman George Jeter said the department hasn't received a complaint but is responding to media reports of possible NCAA violations that may have been caused by improper contact between agents and college athletes. "That's it, precisely," Jeter said. "The number of media reports coming out and talking about possibly things that might have happened and possibly actions by agents, or people who should be agents if they're not, [sparked the investigation]." It has been widely reported that NCAA investigators interviewed football players at the University of North Carolina last week. Greg Little Sr., the father of Tar Heels receiver Greg Little, said his son was interviewed. The Charlotte Observer and News & Observer have confirmed that defensive tackle Marvin Austin also was interviewed. Investigators also have met with University of South Carolina tight end Weslye Saunders, who is from Durham, and Alabama defensive tackle Marcell Dareus. The North Carolina Uniform Athlete Agent Act requires agents to register with the Secretary of State's office and inform a school's athletic director within 72 hours of agreeing to a contract with an athlete. Agents are prevented from furnishing anything of value to athletes before they enter a contract, and they are prohibited from making false representations. Violating the law is a Class I felony. Jeter said messages have been sent to several parties saying they will be contacted by department staff members and advising them not to destroy their records. He said the investigation will focus on the agents themselves rather than athletes or staff members at any of the schools. Marshall, a Democrat who is running for U.S. Senate against Republican incumbent Richard Burr, was unavailable for comment this evening. Five South Carolina players -- including Rock Hill's Stephon Gilmore -- have been named to the all-SEC preseason football team by the league's coaches. Gilmore, a sophomore defensive back, was named to the first team along with senior defensive end Cliff Matthews. Gilmore started every game at cornerback as a freshman last season. A freshman All-American, Gilmore had an interception, broke up eight passes and had 56 tackles. Matthews, a second-team all conference selection last season, had 7.0 sacks and 10.0 tackles for a loss. He's on the preseason watch lists for the Lott, Nagurski and Lombardi trophies this season. Former N.C. State football great Dennis Byrd remains in a Charlotte hospital this morning while recovering from a heart ailment, school executive senior associate athletic director David Horning said. Horning said Byrd had a better night Sunday night, but still is in very serious condition. "Just keep praying," Horning said. Byrd played for N.C. State from 1964 to 1967 and was the first N.C. State player to receive consensus All-America honors. He was selected in May to the College Football Hall of Fame; on Dec. 7 he will be inducted at the National Football Foundation's annual awards dinner at the Waldorf-Astroia in New York. Dennis Byrd, one of the most decorated football players in N.C. State history, is hospitalized with a heart problem, a school official confirmed Friday evening. N.C. State executive senior associate athletic director David Horning said he doesn't know many details, but said Byrd is in a Charlotte hospital and being closely monitored. "The prayers of the Wolfpack nation are out there with him, and we love Dennis Byrd," Horning said. "We love Dennis Byrd. He is larger than life, and he is one of the best defensive linemen who ever played for N.C. State." In May, Byrd became the fifth former N.C. State player selected to the College Football Hall of Fame. He will be inducted on Dec. 7 at the National Football Foundation's annual awards dinner at the Waldorf-Astoria in New York. Byrd, who played for N.C. State from 1964 to 1967, was the first three-time All-ACC selection in football. He was a first-team All-American twice and the first N.C. State player to receive consensus All-America honors. 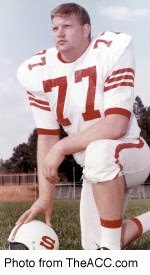 He was a member of the famed "White Shoes" defense and helped the Wolfpack gain a share of the 1965 ACC title and its first postseason win, over Georgia in the 1967 Liberty Bowl. After being drafted No. 6 overall in 1968, Byrd played two seasons with the Boston Patriots before a knee injury forced him to retire. He later enjoyed a 30-yard career as a high school teacher and coach before retiring in 2001. Chris Ward, who at one time had been projected to start at punter for N.C. State in 2010, is not on the team's roster for the fall, school sports information director Annabelle Myers said Friday. Coach Tom O'Brien suspended Ward indefinitely in March for unspecified reasons, saying at the time that Ward was still in class and might be able to return to the team. That's no longer the case. "He will not be back," Myers said. Jeff Ruiz, the 2009 starting punter who had decided to leave school to be closer to home, has returned to the team and is expected to start in 2010. Ruiz, who will be a senior, averaged 37.9 yards per punt last season. Ward, who is from Fayetteville, Ga., redshirted last season as a freshman. He gained notoriety as a high school athlete when he won the best punter award with an average punt of 42.7 yards and a hang time of 4.17 seconds at the prestigious Southern Kicking Invitational. Losing Ward, who had the potential to be a four-year starter, left N.C. State without a scholarship punter after Ruiz exhausts his eligibility this fall. But the Wolfpack punter of the future now appears to be Wil Baumann of Hoggard High in Wilmington, who committed to N.C. State earlier this week. Baumann averaged 44 yards as a junior last season and comes from a high school program that has churned out talented specialists such as current North Carolina kicker Casey Barth and former Tar Heel Connor Barth, who kicks for the Tampa Bay Buccaneers. Hoggard coach Scott Braswell said Baumann, who's 6-foot-5 and 180 pounds, has a similar build to Connor Barth's and a lot of potential. "I think he could be an NFL guy some day," Braswell said. Despite a background that has included coaching from two fathers of University of North Carolina players, Wilmington Hoggard High punter Wil Baumann has committed to N.C. State. The most influential coach in Baumann's career has been Keith Wood, a former Southwestern Oklahoma State kicker recently hired as head coach at Fairmont High after serving as a Hoggard assistant. But punting guru Bill Renner, the father of North Carolina redshirt freshman quarterback Bryn Renner, helped fine tune Baumann's punting. Baumann also has been helped by Tom Barth, the father of current Tar Heel kicker Casey Barth and former North Carolina player Connor Barth, who kicks for the Tampa Bay Buccaneers. Casey and Connor Barth both played for Hoggard. "I don't think they will care too much," Baumann said of committing to the Tar Heels' rival. "They've got a really good punter right now [Grant Schallock], and I don't think they've got a spot [for a punter] right now." Baumann said he is a longtime fan of N.C. State and is eager to enter the school's engineering program. He is 6-foot-5 and 180 pounds and averaged 44 yards per kick as as a junior. He also had a scholarship offer from Northwestern, but said he chose N.C. State because of its academics (he carries a 3.5 grade-point average) and proximity to home. Appalachian State running back Devon Moore and Elon quarterback Scott Riddle are among 20 finalists for the Walter Payton Award that goes to the Football Championship Subdivision's top individual performer. S.C. State quarterback Malcolm Long is also on the list. The award will be presented Jan. 6. Although linebacker Quan Sturdivant will face disciplinary action within the North Carolina football program following his citation for marijuana possession Saturday, it's unclear what that discipline will consist of. Sturdivant, a senior from Oakboro, N.C., who's regarded as one of the top linebackers in the nation, was cited with simple possession of marijuana by police who found less than a half-ounce of marijuana in a car Sturdivant was driving, according to Albemarle police chief Gerald R. Michael. North Carolina coach Butch Davis issued a statement Monday that didn't specify the discipline Sturdivant will receive. "We are disappointed in Quan's actions over the weekend," Davis said. "This is not the type of behavior we expect from our student-athletes. In addition to the outcome of the legal process, he also will face disciplinary action from within the football program beginning immediately." Michael said Sturdivant was cited following a simple traffic stop at 11:15 a.m. Saturday at the parking lot of a Bojangles restaurant. He faces an Aug. 2 date in Stanly County Court. Sturdivant, 21, was a first-team All-ACC selection and a semifinalist for the Butkus Award - given each year to the nation's top linebacker - last season as a junior. He led the team with 79 tackles last season. Appalachian State's game on Sept. 4 against Chattanooga opens the Southern Conference's eight-game television football schedule. The five-time defending conference champions Mountaineers and Mocs will play at 3 p.m. in Chattanooga's Finley Stadium on SportSouth. Sept. 25: Elon at Georgia Southern, 6 p.m.
Oct. 9: Elon at Appalachian State, 3 p.m.
Oct. 16: Furman at Samford, 2 p.m.
Oct. 23: Appalachian State at Western Carolina, 3 p.m.
Oct. 30: The Citadel at Wofford, 1:30 p.m.